SAN ANTONIO (AP) The Thunder don’t believe they blew another big lead, the Spurs simply took it away. Danny Green added 17 points and Gasol had 14 points to help San Antonio end Oklahoma City’s three-game winning streak. The Thunder were outscored 89-69 in the final three quarters after holding the Spurs to a season-low 15 points in the opening period. The Thunder have blown several double-digit leads this season, including an 18-point advantage against Boston in a 101-94 home loss Nov. 3. Aldridge put back of Green’s missed 3-pointer gave the Spurs a 102-99 lead with 24.2 seconds remaining. The Thunder missed two 3-pointers on the ensuing possession, but Carmelo Anthony tracked down a second offensive rebound and made a 25-footer with his foot on the 3-point line to cut the lead to 102-101. Gasol made two free throws, and Russell Westbrook stumbled to the court and threw up an airball on a 3-point attempt as the game ended. Anthony had 20 points to lead the Thunder. Westbrook was held to 15 points after scoring 10 in the opening period. He was 5 for 22 from the field. ”They just played faster and they just did a good job of getting themselves back in the game,” Westbrook said. The Spurs rallied behind their usual formula of hounding defense and 3-point shooting. Davis Bertans hit three consecutive 3-pointers in the third quarter, tying it at 78 with 38 seconds remaining with his final 3 of the run. The 3-pointer also closed a 58-35 run after the Spurs trailed 43-20. Thunder: Oklahoma City entered the game leading the league in steals (10.4) and opponent turnovers (19.0). The Spurs had 13 turnovers, most coming in the first quarter. The Thunder have never finished in the top five in either category since leaving Seattle. … Westbrook, Anthony and George have split game-high scoring honors throughout the season. George has led six times and Westbrook and Anthony have done so on five occasions each. … Nick Collison did not play for the 14th time this season. The 15-year veteran played five minutes in his only appearance of the season. Spurs: Kawhi Leonard, who has not played this season, remained out with right quadriceps tendinopathy. There is no timeline on his return. … Tony Parker worked out with Spurs shooting guru Chip Engelland during morning workouts as he rehabilitates from quadriceps surgery. … Kyle Anderson stayed in the lineup after getting hit in the jaw while battling for a rebound under the Thunder’s basket with three minutes remaining in the game. … San Antonio’s previous low in the opening quarter was 17 points at Dallas on Nov. 14. Westbrook had a quick response when asked what the Thunder must do to avoid giving up big leads. ”Just play the same way (for) 48 minutes,” he said. 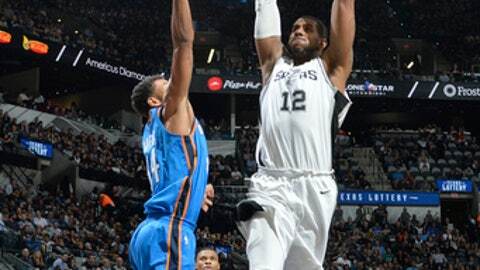 Aldridge continued his resurgent season after being the subject of trade talks in the offseason following two disappointing seasons with the Spurs. The 12-year veteran has become San Antonio’s top scorer and primary leader with Leonard and Parker sidelined. The Spurs have played the entire season without two of their leading players in Leonard and Parker, but they are not hanging their heads about it. Thunder: Visit New Orleans on Monday night in their first game against the Pelicans after sweeping last season’s series. Spurs: Host Atlanta on Monday night before embarking on a two-game trip.